In 2009, 23.5% of Brunei crude oil was exported to Indonesia. This was followed by Australia (17.4%), South Korea (16.4%), India (16.2%), New Zealand (9%), China (7.9%), Thailand (3.4%), Singapore (2.8%), Japan (2.4%), Philippines (0.5%) and Malaysia (0.5%). To arrest declining production of oil fields, in 2000, Brunei embarked on one of the largest single three-dimensional (3-D) seismic survey in the world, conducted in a new frontier. The acquisition of the 10,000-square kilometer 3-D seismic data over (Block CA-1) and (Block CA-2) in the deepwater areas of the Brunei Exclusive Economic Zone was completed in early 2001. Petroleum Geo-Services (PGS) of Norway was contracted by the Government to execute the project in close co-operation with the Petroleum Unit of the Prime Minister’s Department. PGS’s seismic vessel Ramform Challenger was mobilized to carry out the acquisition programme. The high-technology vessel was equipped with on-board processing facilities and geared to tow 10 recording streamers, each 6000 metres long. The Petroleum Unit of the Ministry of Energy under the Prime Minister’s Office regulates and monitors all activities that are carried out by concessionaires holding concession areas in Brunei. Planning for the release of the new areas was not singly and independently viewed. It was actually developed with multi-prong strategies to value-add the areas under offer for bidding. These approaches were integrated to form a consolidated framework to enable the Government to formulate plans for the growth of the local oil and gas industry in the new millennium. In yet another concerted effort by the Government to stimulate growth and enhance the prospect of these areas. A non-exclusive geochemical survey was also undertaken in the deepwater blocks covering the same 10,000 square kilometers as the 3-D seismic survey. Surface Geochemical Service AS (SGS) of Norway had been contracted by the Government to undertake the project. Geochemical samples had been taken from the sea-floor and analyzed. Surface geochemical exploration for petroleum is the research for chemically identifiable surface or near surface occurrences of hydrocarbons, or hydrocarbon-induced changes, as clues to the location of oil and gas accumulations. Brunei Darussalam has proved reserves of 1.1 billion barrels of oil, which is 0.1% share of the world’s reserves. In the same year, production was 168,000 barrels daily. Proved reserves of natural gas was 0.35 trillion cubic metres in 2009 and production was 11.4 billion cubic metres. Brunei is the 42th largest oil producer in the world and the 9th largest exporter of liquefied natural gas. Two major concessionaires are currently operating in Brunei. They are Brunei Shell Petroleum Company Sdn Bhd (BSP) and Total E&P Deep Offshore Borneo B.V. Brunei Shell Petroleum Sdn Bhd is a company joint owned by the government and the Asiatic Petroleum Company Ltd. Total is the operator for Block B joint venture. Offshore Block B is a joint venture between the Government, Total and Shell Deepwater Borneo. Both BSP and Total now operate the 6,319.71 square kilometre concession areas. Exports of crude oil and natural gas, account for over 90% of the country’s GDP and over 50% of exports. Overall, oil production has declined in recent years, and growth rates have fallen significantly. Brunei oil reserves are expected to last 25 years and natural gas reserves 40 years. However, discovery of new onshore fields may increase the lifespan of the reserves. 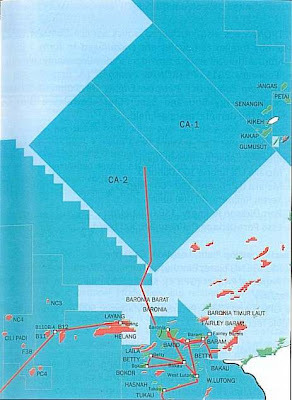 In 2011, deepwater Block CA-1 (formerly Block J) which covers an area of more than 5,850 square kilometers was awarded to a consortium consisting of Total E&P Brunei B.V, BHP Bilton Limited, Hess Limited, PETRONAS Carigali Overseas and Murphy Oil Pil Limited. 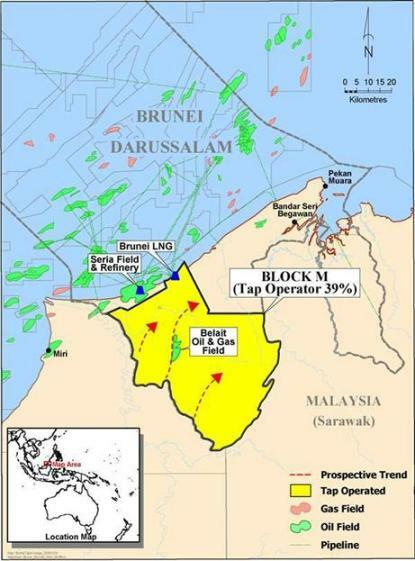 Block CA-2 (formerly Block K), covering 4,944 square kilometers was awarded to a consortium comprising Murphy Oil Corporation, PETRONAS Carigali Overseas, and Canam Brunei Limited (Petroleum BRUNEI). Situated in the town of Seria in Belait District, Seria Oil Refinery is operated by Brunei Shell Petroleum. It has a production capacity of 10,000 bpd each for its Crude Distillation Unit (CDU) and Reformer unit. This refinery produces unleaded motor gasoline, gas oil, Jet A1 and kerosene. Brunei’s first petrochemical plant producing methanol from natural gas began operation in 1972. The Brunei LNG (BLNG) plant was a joint venture between the Government, Shell Overseas Trading Limited and Mitsubishi Corporation. Production figures of natural gas by Brunei, according to CIA World Factbook, were as follow : 2011 – 13.4 bcm (world ranking 35). By way of comparison, natural gas exports by other top countries for 2011 were : Russia – 182 bcm, Canada – 101.9 bcm, Norway – 78.1 bcm, Algeria – 62.6 bcm, Turkmenistan – 58 bcm, Netherlands – 50.2 bcm, India – 29.6 bcm, Qatar – 25.9 bcm. Brunei Shell Petroleum announced in May 2010 that its Mampak platform has hit production capacity of 20,000 barrels a day. Drilling bega in January 2009 and became productive five months late. At present the Mampak field contributes about 15% of the country’s oil production. It located 30km off the shores of Tutong District. Meanwhile, Block B Maharajalela field has been undergoing more activity with Total E&P Brunei B.V drilling two other wells named ML-5 and ML-6. Testing of ML-5 in late 2010 produced 10 million cubic feet of gas and 220 barrels per day of condensate. As ML-6 is a high pressure, high temperature reservoir, Total has partnered with Shell Deepwater Borneo Ltd in this exciting endeavour.